The tyrant King Zephra has waited nineteen long years to meet his destiny. In the deepest corner of his hidden lair he has finally found a way to break the laws of magic. His malevolent scheme will forever ensnare the world. And the Feldonian nation will be powerless to stop him. Yet destiny comes in twos. For on the very eve of Zephra's rise to power nineteen years ago, two brothers were kidnapped from their homeland by the savage Miirvkin. Brothers who, growing up amongst their hated foes, are fated to return to Feldom at the turning point of this ancient struggle. Now, whilst strange creatures stalk the shadows, and the darkness encroaches, destinies will clash. Thibalt and Christill will find that they have a larger part to play in the fate of their homeland. Yet the salvation of an entire race will weigh a heavy burden on them. Julian Saheed's love of fantasy came from reading the works of Raymond E Feist and David Eddings as a youth. "I grew up in a household with a mother who loved science fiction and fantasy as well as a brother who role played and war gamed. So as you can imagine I grew up playing Dungeons and Dragons (Which I still play every Wednesday) and watching Star Trek (Which I still watch). So it was no surprise that I grew to love Fantasy literature so much." He completed a Bachelor of Commerce at the University of Melbourne, with Honours in Marketing, and now works in the Australian banking industry. He resides in Melbourne. 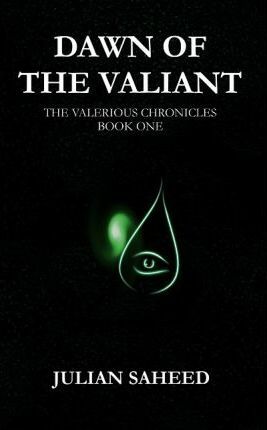 Dawn of the Valiant is his first published novel and the first in an Epic Fantasy Trilogy that has been developed over many years. It is an idea sparked on a high school camping trip, and developed over many long nights into a vivid and fascinating world full of wonder and drama.